MAnE™, the Mission Analysis Environment, is a system of software tools, seamlessly integrated within a graphical user interface, to support the analysis and optimization of multiple leg, heliocentric missions which employ conventional, high-thrust propulsion. Full optimization of missions with up to ten distinct legs is supported. Starting in 1992 following the Space Exploration Initiative, MAnE was developed to address the general absence of readily available, validated, documented and supported mission analysis tools within the industry. The objective was to introduce modern software design and presentation methodologies into the product to improve maintainability and usability and to give highest priority to program integrity. This latest version 3.5j, which was released in May 2018, continues the evolution and upgrading of the product. MAnE is now a well recognized tool in the US space exploration program. It has been used as a primary mission design program for the funded Discovery programs NEAR, Contour, and MESSENGER and for the New Frontiers program New Horizons. It has also been used to design numerous missions for other Discovery and New Frontiers proposals. Licensing of MAnE is required for each individual workstation on which the application is to be executed. Licenses are perpetual and include one year of support and version upgrades that are released during that time. Continuation of support is available via annual subscriptions. Contact SpaceFlightSolutions for current licensing and support fees for MAnE. 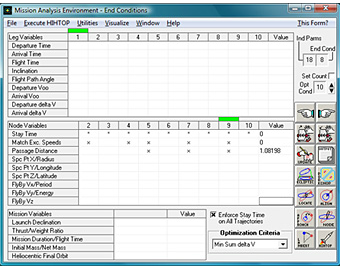 A program to perform a variety of time and date conversions and simple math computations involving calendar and Julian dates and time intervals. Programs that provide for the display, printing and writing to file of encounter details at swingby and at planetary orbit escape and capture. The write to file feature provides for a general interface and transfer of data among other mission analysis tools and programs. Comprehensive spacecraft and propulsion system model permits detailed spacecraft component specification and distinct modeling of the propulsion system for each maneuver. Mission optimization criterion may be maximum net payload or minimum initial mass, total mission Δv or mission duration. Velocity loss estimates and multiple periapsis burns for planetary escape and capture may optionally be included and accounted for in the optimization process. Special situations, such as multiple revolution legs, hyperbolic heliocentric arcs, retrograde trajectory legs, and exact n-pi transfers (essential for analyzing repeated encounters of the same body) are fully supported. The end conditions which link trajectory legs may be represented by orbit capture and escape with specified or optimal stay time at the massive planets, powered or unpowered planetary swingby, rendezvous with asteroids and comets with fixed or optimal stay time, powered or unpowered flyby of small objects, or deep space burns, in any combination. Targeting to specific heliocentric orbit conditions on the final leg (e.g., solar probe mission) is supported. The MAnE GUI provides a common framework within which the many components of the environment are integrated. The framework provides an organized presentation of the input required for a given environment component and a convenient method to execute the component and retrieve the relevant results. This visual approach enhances understanding of the component and of the problem being addressed and significantly reduces instances of missing or erroneous inputs. The backdrop of the MAnE GUI is one of the four windows of the trajectory optimization component. 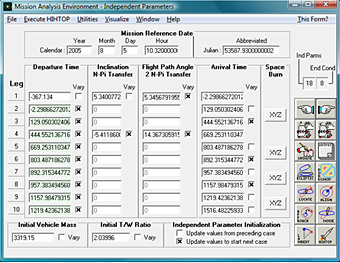 The default window is the Mission Definition window used to describe the mission being analyzed and optimized. The mission is defined using Drag-and-Drop and Point-and-Click methods to the greatest extent possible. 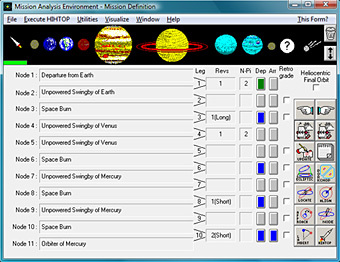 The figure below shows the Mission Definition window for the first ten legs of the MESSENGER mission, a Discovery mission designed by the Johns Hopkins University Applied Physics Laboratory. Click here to learn more about the MESSENGER mission. 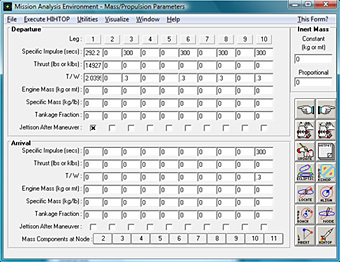 Once the mission is defined, remaining input parameters are provided in the Independent Parameters, End Conditions and Mass and Propulsion Parameters, as seen in the following three figures. These windows are supplemented with auxiliary input windows as necessary. Note the common toolbox of operations that appears in each of the windows. Other components of the environment are accessible from the bar menu and from the toolbox. Numerous textual reports produced by MAnE are accessible via the Output button of the toolbox. Graphical reports of the results produced by MAnE include the ecliptic projection of spacecraft and ephemeris body orbits. The figure below shows the ecliptic projection for the MESSENGER mission mentioned above. MAnE also provides utility programs to map single leg trajectories over ranges of departure and arrival dates and to produce contour charts from these maps. The figure below displays the total mission rendezvous propulsion requirements contours for both direct and 1+ revolution transfers to the asteroid Nereus, arriving in the time period surrounding its 2009 perihelion. Most utility programs included in MAnE produce both textual and graphical reports. The trajectory optimization program is based upon the matched conic model of the solar system; that is, heliocentric trajectories are computed under the assumption that the sun is the only attracting body. Once the terminal heliocentric velocities are known from the solution to Lambert’s Problem, the velocities relative to the terminal body are evaluated and equated to planetocentric conditions at infinity. This method is alternatively referred to as “matched asymptotes” or “zero sphere of influence patched conic”. It is generally regarded as sufficiently accurate for purposes of preliminary mission analysis and for propulsion system sizing and selection. Trajectory optimization is achieved with the indirect techniques of the ordinary calculus. While the solution to the boundary value problem that results with this approach is considered by many to be overly difficult, the robust iterator that is used in the program normally renders the solution routine. Advantages of indirect techniques are that convergence tends to be quadratic in the neighborhood of the solution and that convergence assures that the solution is locally stationary. Store, retrieve, and maintain a database of accumulated case input data files. Convert among various time and date units and perform date calculations. Calculate dates of opposition/conjunction alignments of any two bodies. Calculate dates of nodal crossings of one celestial body on the orbit of another celestial body. Calculate the dates of closest approach of any two celestial bodies. Evaluate the location of any celestial body on a given date. Solve Lambert’s problem for the conic section linking any two terminal points in a given transfer time. Query the JPL asteroid/comet ephemeris file to identify all among the 750,000+ entries with characteristics meeting specified criteria. Display all information contained in the ephemeris files about a specific planet or other celestial body. Investigate potential mission extensions by identifying future close encounters with ephemeris bodies known to the environment. For example, this feature was used to identify the asteroid Mathilde encounter opportunity on the NEAR mission. Map trajectory data over specified ranges and increments of departure and arrival dates. Perform a survey of all local minima of departure, arrival, or combined v’s over a range of launch dates, flight times, and trajectory classifications for each combination of launch and target bodies in a given list. Generate path reports of position vs. time for the spacecraft and/or ephemeris bodies. Produce a wide variety of reports for mission trajectories. – Display/print ecliptic plane projections of celestial body orbits and spacecraft trajectory. 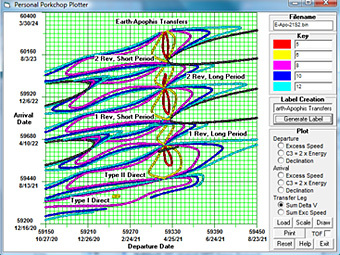 – Display/print contour (porkchop) plots of trajectory parameters on departure date vs. arrival date grid. – Create external files of trajectory paths for input to commercial spreadsheet and graphics programs and other mission analysis software programs. To prevent the possible inconsistency of information, the User Guide links to the Help files as appropriate. MAnE is now being tested for operation under the Windows 10 operating system and successfully runs under Windows XP through Windows 10. A minimum of 1 GB of free disk space is recommended. Memory requirements are principally those needed to adequately run the operating system. Computer processor speed of 1.5 Ghz or higher, which essentially includes all modern computers, is recommended. SpaceFlightSolutions is a software developer specializing in aerospace environment analysis software, offering training, aerospace mission consultation, aerospace trajectory analysis and support, and more to clients worldwide.